Vhol are a strange supergroup. I’m not sure anyone was expecting the debut album from Hammers of Misfortune, YOB, and Agalloch members to sound like an intergalactic transmission of aliens performing crusty second wave black metal and NWOBHM simultaneously, but it did and it was absolutely fantastic. It was, admittedly a bit of an acquired taste; extremely dense and claustrophobic but always with a melodic undercurrent. It certainly could take more than one spin to get into and by front loading it with some of the less accessible tracks it became even more difficult. Deeper than Sky is much more immediate album. The lead track that streamed on Bandcamp, leading up to release day, featured more melodic vocals and guitars than those early tracks on Vhöl. The whole focuses even more on melody, and trades most of the black metal for thrash. The majority of the record flies by at breakneck speed but the subtle musical changes as well as less claustrophobic production make it much more accessible, without sacrificing what made Vhöl an exciting album. 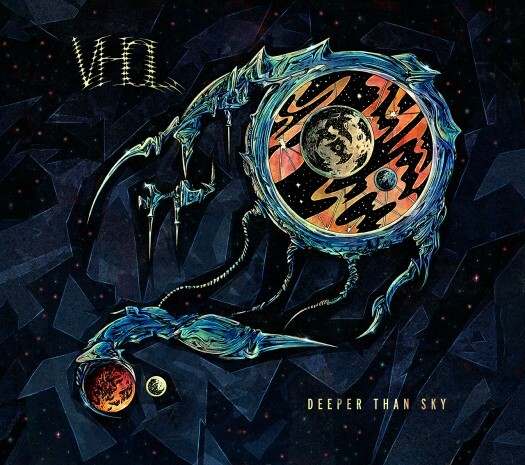 An impressive refinement to a band who’d already created a completely new sound in metal, Deeper than Sky is way more fun than most metal this dense and complex. Of particular note in the "fun department" is the track "Paino". It's Vhol through and through, but all the lead acrobatics are on piano, rather than guitar. Vhol, as a band, work so well because of each member's unique contribution. The fuzz bass and the lightning drumming meld with the guitar and vocals to make a bizarre and bizarrely cohesive unit. By lightening some of the denser sounds and lessening the black metal influences the band have opened up their sound making everything shine that much more. Mike Scheidt’s vocals, though still thoroughly unique (and likely polarizing) tend towards more melody than the debut album as well. He employs a lot of melodic falsetto and shout singing on some of the thrashier tracks, again making the whole album just sound fun. John Cobbett’s guitar work is undoubtedly the show stopper, though. His deft axe handling was key in holding together the sonic insanity of the first record but what he’s doing on Deeper than Sky is simply astonishing. Every riff is fantastic and they range from soaring NWOBHM dual guitar attacks to machine gun thrash riffs and slow interludes. The title track "Deeper Than Sky", amazingly, showcases all of this in a single track. It’s written as a three part sonata with three ragers separated by quiet interludes. It’s arguably the best guitar work on a metal album this year and the support of the rest of the band makes it unlike anything else out there. Deeper than Sky makes it clear that these aliens are done broadcasting from space and are ready for the big time.